The San Luis Unit is part of San Luis National Wildlife Refuge. 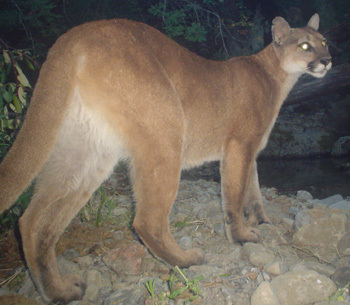 The California Department of Fish and Game is authorized to operate the hunting program. The check station for San Luis is operated out of a trailer at the Salt Slough Unit. It’s about a ten minute drive from Volta. At the check station I asked many questions, and where Nancy had been nothing but helpful, the guys at Salt Slough were contrary. I don’t blame them as they put up with a million questions from novice duck hunters. I took what info I could glean from them, which wasn’t much. One hunter, on his way to the Gadwall Unit, offered that is was a good spot for teal and an occasional pintail, but not a mallard spot. I was thinking about going to parking Lot 1 at San Luis, but was a little worried about it being crowded. I don’t like too much competition. Another hunter signed up to wait for an opening at one of the Salt Slough “stake” blinds. He corrected me when I incorrectly called them space blinds. Oh well. While standing around, I put my name on the list. It was now almost noon and hunters were checking out. When a hunter checked out from Lot 1 at San Luis with six mallards, I decided to make a decision. There were four hunters left in Lot 1. Didn’t sound too bad. I left the parking lot at noon with backpack, dog stand, tule seat, two decoys and jerk string. The pack seemed heavy. It it was breezy, but hot. Nothing was flying. I set up at a decent looking pond and watched for ducks. A flock of specs came out of the south and looked like they might come over me in range. About a hundred yards out they turned. Maybe I called too much – or maybe they just turned for no particular reason. About 2:30 I spotted a flock of ducks to the south. They were working. At 3:00 PM I decided to make a move. I moved close to where the flock had passed and set up again. At 4:00 PM some mallards came in and I blew my chance by getting tangled in the tules. Oh well, at least I’d had a chance at a greenhead. About 4:30, more mallards and a couple pintails with them. They flared a bit as I rose, but it was a good chance and a clear miss. At least something was happening. Fifteen minutes later another group of mallards. This time I waited for the bird to pass and shot him in the rear. Down he went. I was worried as he’d come down out of my sight. Lola was all over the swimming drake and I had my first mallard of the day. Back to the tules. There was time for more. A greenhead come over and I missed him three times. I shouldn’t have kept shooting but my blood was getting hotter. Now ducks were working regularly and another hunt to the east was having a lot of action. Still there were birds for me. Specs passed over regularly and I noticed that mallards seemed to be attracted by my spec calling. Maybe they were foraging together. A pair of mallards came towards me. They locked on my decoys. Without calling I laid low and waited. As they passed in front of me I drew on the drake and they both came down. I didn’t plan on shooting hens, but sometimes it happens. 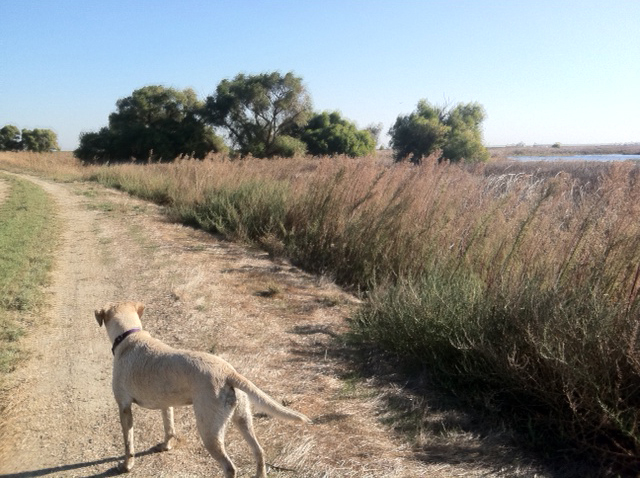 I sent Lola in to the tule patch where the two ducks had dropped. Out she came chasing the drake. She had it. I took the bird from her and sent her back for the hen. She rattled around in there for a few minutes and them popped out with the hen in her mouth – giving it up reluctantly. More ducks. A pair of mallards passed on the wrong side of me – towards the sun. Since they were in range I took the shot and one of them sailed down about 150 yards away. It would prove to be an ugly retrieve. After a bunch of sweat, three more shots and a long chase, I had my second hen and called it a day. I still don’t know if the hen was the original mallard. I think I shot the drake and the hen landed with it. When it jumped up I thought it was the drake and knocked it down. Afterward I wished that I had gone back to look for the drake, but it was too late. At 6:00 PM I called it quits. The hike in was long, hot and mosquito covered. I ended up with bites everywhere, but it was all worth it. I felt 25 years younger. And, once again, the marsh seemed unchanged from 1986. State owned Volta Wildlife Area has not changed much in the past 25 years. The trailers parked in the parking area are a nice addition. Twenty-five years ago only Gray Lodge offered hunters a place to park trailers. Now, many of the public hunting areas allow trailers to be parked for the season. I inquired as to how many hunters were signed in and found out that 66 hunters were in the field, with a maximum of 150. Didn’t sound crowed. The marsh has not changed much. I thought about visiting parking lot 2 and the pond 10 area, an area I’ve hunted in the past. Instead I decided to hunt an area where there were no other hunters. After parking in Lot 3A, I walked to a small pond where a few shovelers took flight. Seeing no other obvious opportunity, I found a dry cattail patch for me and another for Lola. I carried two mallard decoys and that was enough to attract a few spoonies and I shot one while missing another. With prospects for more action or better ducks (mallards) looking slim, I picked up my decoys and walked the area to decide whether to stay or move. Moving looked like the best option. Back at the check station, I asked Nancy, the attendant how many hunters were hunting out of Lot 2. She said twenty and that seemed like more than I wanted to compete with.I concluded that the day would be more interesting if I moved to another refuge. I had all day to hunt and maybe I’d be better off in the afternoon. I elected to check out Salt Slough and the San Luis Units. Nancy let me know that I could come back and re-enter as long as I did so before 3:00 PM. Another option. Per my plan, which was to revisit a Volta duck hunt of 25 years ago, I rose early and headed south. I was antsy and couldn’t stay in bed until the 5 AM alarm went off. It was about 4 AM when I gave up on sleep climbed out of bed. This was something I’d been thinking about for a while. Hard to believe 25 years had passed. I haven’t been hunting the refuges much for a while. How would this trip be different? For the most part the marshes are constant – or at least that has been my impression. My eyes were opened on this trip. The grasslands had expanded tremendously over the past 25 years and public hunting abounds. It’s late and I’m tired. I’ll expound on this soon. Arriving at shooting time, I elected to park at lot 3A. I was the only car parked there. Lola enjoyed chasing coots. This year I intend to spend a few Wednesdays at refuges. I’m going to give it a try tomorrow. With season pass in hand, I’ll arrive about 8:00 AM and hope that I can find a good spot to throw out a couple decoys. We’ll see and you’ll know tomorrow night. It will be a sun glasses and mosquito repellent day in the Grasslands. Didn't need much clothing on this duck hunt. I bought a gillie suit that matched the green tules. I think it helped me hide. Haven’t said much about ducks lately. Made a couple preseason trips to Mayberry. And, on Friday, I walked the spot I intended to hunt on opening day. Because our club is now so different from the way it used to be, it’s important for me to scout out hunting spots or I might run into unwadable water. That turned out to not be a problem on this opening as the water level was lower than last year. I had seen mallards using a particular spot and set up my decoys, including a jerk string duck and wind-wacker on Friday. I figured eight decoys would be enough and it was. The day got off to a less than perfect start, when Lola refused to stay on her dog stand, leading me to move to a spot where I could keep an eye on her. In the darkness, the jerk string got tangled in my tule stool and I dropped my shotgun into the water, completely submerging it. Even old farts get too excited on opening day. Making a recovery, I sat and watched as the opening day parade of ducks began. There’s no other day like it. The mallards were flying at half speed and oblivious to Lola and I. I waited for a perfect shot to start it off with and before long it came. The drake passed directly overhead and I raised the Nova and fired straight up. The duck dropped dead. Easy retrieve for Lola. Soon I had four and a drake landed in the decoys where I could not see it, but Lola did. She jumped off her stand and I reponded by dropping it in front of her. That made five greenheads in five shots. The sixth duck was on a suicide mission and I dropped it. Hit hard. Wondered if it would be edible. Now the real test. 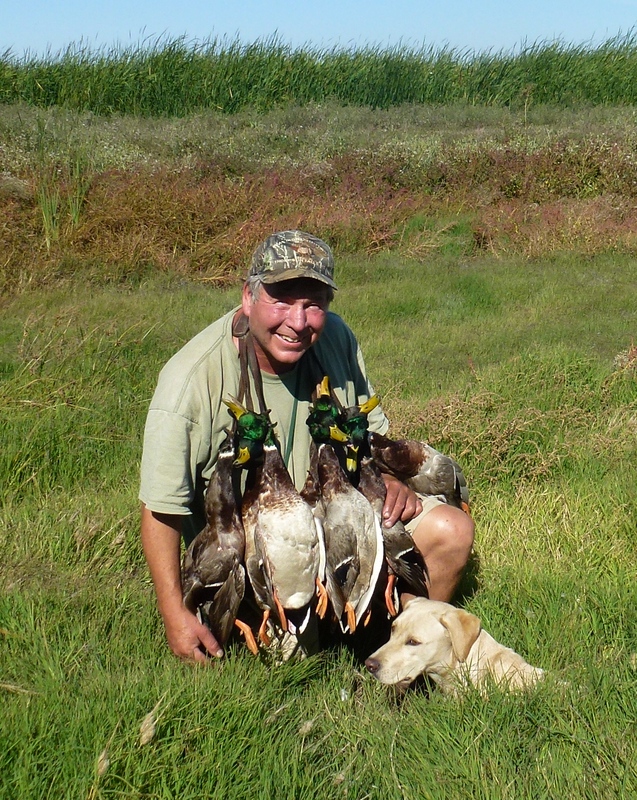 Could I pull off the seven-bird greenhead-limit in seven shots. The answer came after about a half hour of waiting. About 10:00 AM three mallards came directly at me. I stood a little early and the drake in my sights began to flare a little higher…boom..it didn’t fall. Thinking I’d nicked the bird I fired again. Same result. I’ve never killed any duck limit without a miss, and that streak will continue. I did kill the eighth bird I shot at, with one shot. So I matched my best duck-shooting day ever. It all seemed so simple. The day was nearly perfect in many aspects. And, it was probably as close as I’ll ever come to the seven-bird seven-shot limit. As the other hunters came back to camp, I found that not everybody had great shooting. I had been fortunate to locate such a hot spot. Even on opening day, such success is elusive. On Sunday, with faster ducks and less certainty, my shooting returned to normal. The hot weather reduced time in the field, but the Sunday hunt was better than average. With a refuge season pass in my wallet, I’m planning to get out and about more this season. I guess all elk hunts are up and down. That’s the nature of the beast. 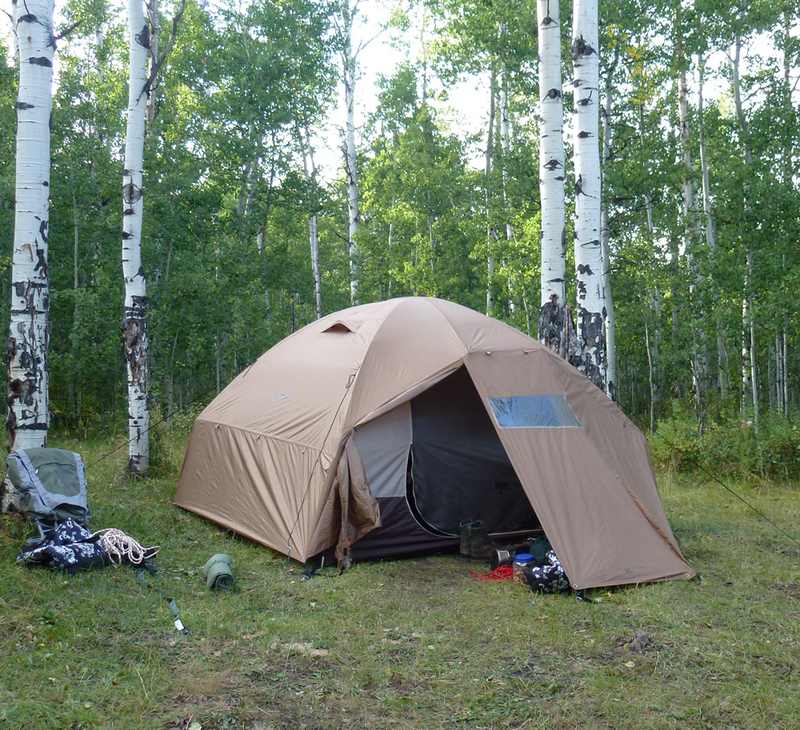 Off to a great start, while setting up camp, we heard elk bugle on nearby ridges. My new Eureka tent was quite roomy and comfortable. On day two, we spotted elk in the open and many of them bulls. It was looking like a slam dunk. Day three was the same, with elk appearing all around us. Day four and five brought overcast weather and swirling unpredictable winds. 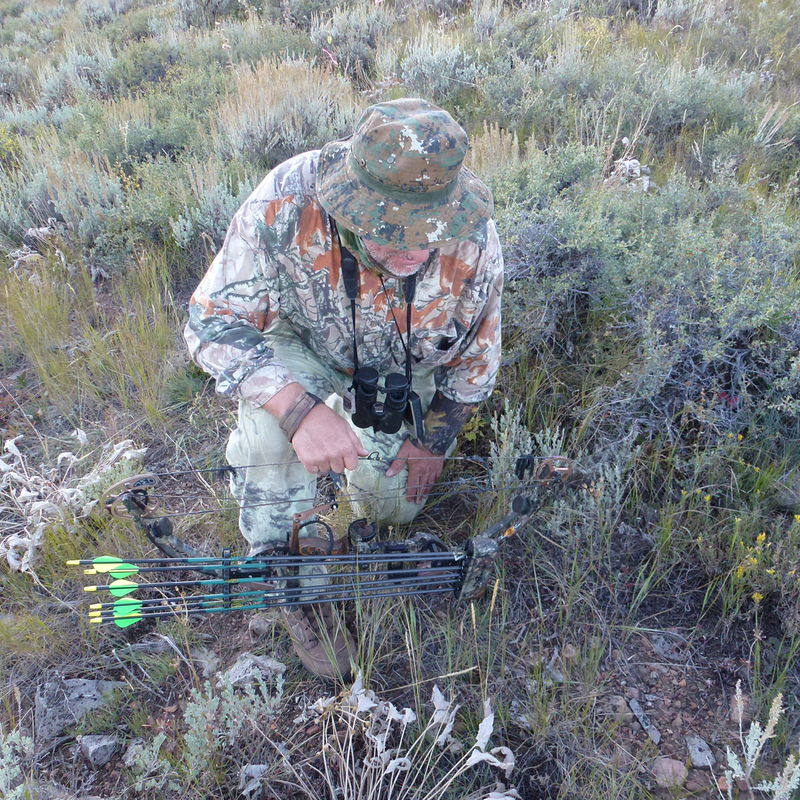 For two days I hunted without seeing a single elk, while hearing only a few weak bugles. And, other hunters seemed to be one step ahead of me. Efforts to return to a couple of my old haunts, backfired – once due to a herd of sheep and the second time when two hunters showed up just ahead of me. 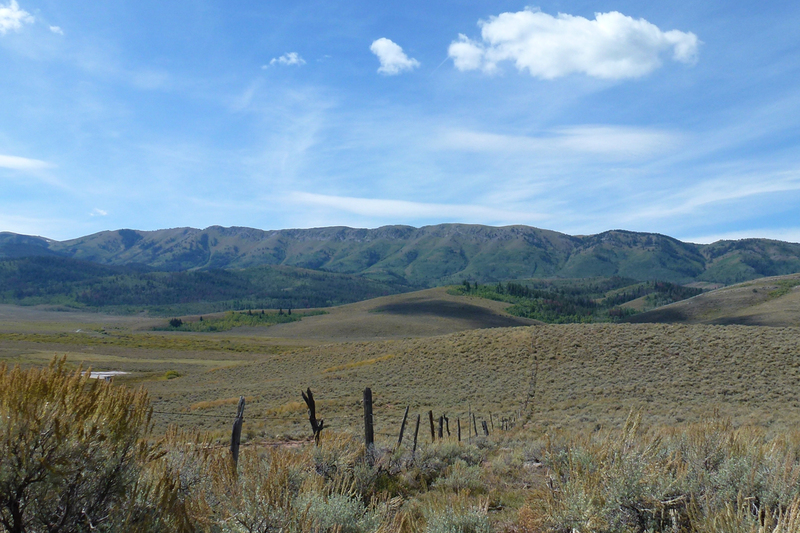 Southeast Idaho has a great mix of habitat for elk and deer. I was a bit discouraged, but on day six, things turned around. Rob pointed out a knob where he’d seen a herd bull bugling two days in a row. Wes and I sneaked into the area and called with success. Several bulls came in to check out my calling. Wes had four young bulls grazing within 50 yards of him, but the thick cover prevented any clear shots. A two-point bull walked past me at 25 yards, but didn’t stop long enough to give me a good shot. I had my bow drawn. In the evening of day six, we set up next to some bugling bulls and waited to see what would happen. A five-point bull passed by at 35 yards, giving me a broadside shot. The arrow hit him a little far back and we never picked up much of a blood trail. Day seven was spent looking for the arrowed bull, but it was to no avail. Wes found a few drops of blood and then half my arrow. The bull ran quite a ways, making the blood trail difficult to follow. Elk are extremely tough animals, but I was surprised that we didn’t find him. I believe the shot was not fatal, but I’ll never know for sure. Late on day seven, I loaded up my gear and headed to Nevada and my muzzleloader mule deer hunt. Much like this post, the elk hunt had flown by. A week isn’t enough time to properly hunt elk in the rut. But, I had the Nevada mule deer tag and was determined to give it a try. Rob and Wes didn’t have much more action after I left, but Wes had received ample indoctrination during the excitement of day six and tracking of day seven. Came upon a mountain lion track while hiking near Del Valle Reservoir last week. 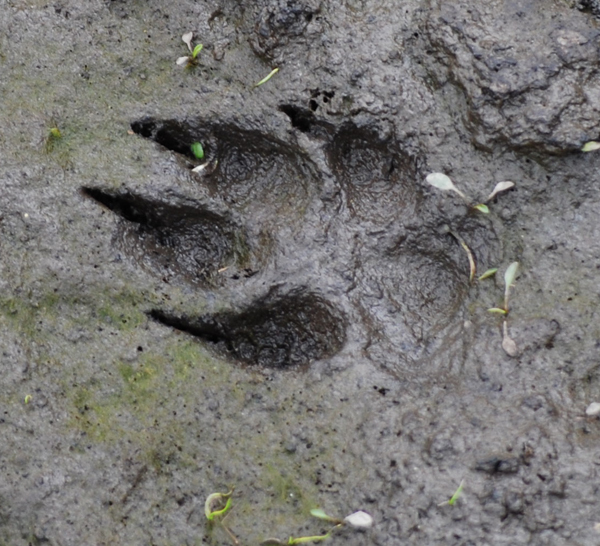 It had been raining and the ground was nearly saturated, good conditions for seeing tracks. 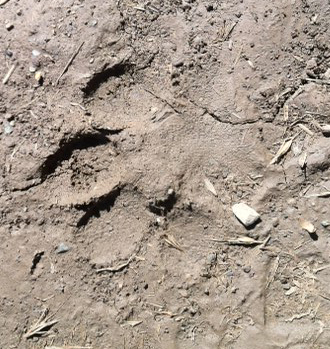 I was looking at a variety of tracks when I came upon a set of mountain lions prints. I photographed one the clearest tracks with my iPhone camera. Here it is. The mountain lion track is more round than oval and the claws don't show, unless the lion slips or needs traction. When the lion slips, it will involuntarily extend its claws and they will show as points in the mud. The heel pad of a lion appears larger than a coyote or other canine. Here’s a good example of a coyote track. The coyote track is more oval and the claws show clearly in the track. The heel pad does not appear as large. The mature coyote track is smaller than the mature lion track. Large domestic dogs often leave tracks as large as lion tracks and sometimes it can be difficult to distinguish between the two. In the case of this lion, I would give the ID a high degree of confidence. A lion like this can take a heavy toll on a local deer population, especially if she has juvenile cubs.Coyotes usually don't stop to be photographed, except in Yellowstone.